As a small boy growing up in eastern Kenya, Abdullahi Hussein Ali would sometimes glimpse hirola antelope in the wild. Today, he strives to make sure they can even be seen at all. Ali, a third-year doctoral student majoring in the Program in Ecology (PIE) at the University of Wyoming, has spent nearly two years studying the ecology and working to conserve the rarest antelope on Earth, of which 400-500 are known to exist, according to the Zoological Society of London (ZSL). 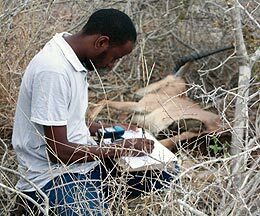 As an EDGE (Evolutionarily Distinct and Globally Endangered) Fellow sponsored by the ZSL, Ali participated in a first-ever major conservation research project, in which nine hirola antelope from seven herds were fitted with GPS collars. During an 18-month period, he and other researchers from the Kenya Wildlife Service gathered crucial information about the animals, including population growth, herd movements and behaviors in preparation for the collaring effort. The ongoing research is conducted in the Ijara District, located in eastern Kenya. The EDGE of Existence program is the only global conservation initiative to focus specifically on threatened species that represent a significant amount of unique evolutionary history, according to a Jan. 28 ZSL release. The EDGE mission is to make the public aware of the endangered species, and provide governments and conservation groups a platform to take action to conserve such species. Ali offers many potential reasons the hirola have dwindled from about 15,000 in the 1970s to numbers so low that not a single antelope exists in a zoo or elsewhere in captivity. Extensive overgrazing of livestock has decimated grasslands, where hirola feed and roam, he says. Lions, cheetahs and wild dogs thrive in the region and are the hirola’s known predators. Rinderpest, an infectious viral disease common in cattle and domestic buffalo, also has cut into the antelope’s numbers, especially during the 1980s. With the elimination of elephants and rhinos (which shared and maintained habitat for hirola) due to trophy hunting, grasslands also were slowly converted into bush lands, Ali says. In addition, some illegal hunting of the antelope has taken place. “It’s a complex issue. There are a number of factors involved,” Ali says. 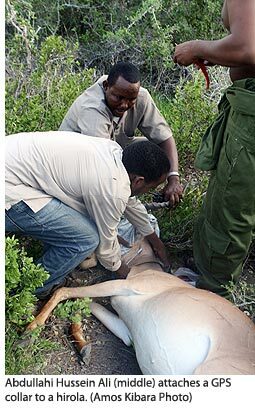 As part of Ali’s graduate project, members of the Ishaqbini Community Conservancy, Kenya Wildlife Service and local communities helped locate hirola herds. During three days of flight during December, Ali’s group tracked, tranquilized and tagged nine hirola with GPS tracking devices. Ali says only seven herds of hirola were identified between Boni Forest and the Tana River in the Ijara District along the Kenya-Somali border. At least one antelope per herd was tagged, a process that took less than five minutes per animal, Ali says. Still, he was encouraged by his observations of the animals, also known as “four-eyed antelope” because of their large, pre-orbital glands. Because these animals have continuously declined over the years, the first predator-proof sanctuary for hirola was established in 2012 in Ijara in an effort to bolster their numbers. Forty-eight hirola were captured and relocated to the sanctuary, where the antelope were sequestered from cattle and predators, and abundant grazing habitat was provided. In the coming years, Ali says this protected herd’s survival and recruitment will be compared to herds observed in the wild. In 2010, Ali applied to be an EDGE Fellow to put his education to use. “Because of my continued determination to save the species and the region I came from, these factors were probably why I was considered,” says Ali, a Kenyan who grew up in Garissa, a city of about 500,000, located nearly 400 kilometers east of Nairobi City. Ali belongs to an ethnic pastoralist Somali group that inhabits Kenya, Djibouti, Ethiopia and Somalia. He received his master’s degree in conservation biology and his bachelor’s degree in wildlife management, both from the University of Nairobi. Goheen is Ali’s graduate adviser. Goheen has worked on wildlife ecology in Kenya for the past decade. In the ZSL announcement released today (Monday), conservationists at the ZSL hailed the GPS collar effort a success. Founded in 1826, the ZSL is an international scientific, conservation and educational charity whose mission is to promote and achieve the worldwide conservation of animals and their habitats. During the past 30 years, hirola numbers have plummeted by almost 90 percent, according to Cath Lawson, ZSL’s EDGE program coordinator. “As the sole representative of its group, the loss of the hirola would be the first extinction of a mammalian genus on Africa in more than 100 years,” Lawson says in the ZSL press release. Ali says he is grateful for the opportunity to work with scientists with expertise in the field and to assist wildlife in different parts of the world.